Since 2015, streams of refugees and migrants have been coming to Europe, and now hundreds of Iranians and Syrians have found themselves in Denmark. The Iranians (former Shiite Muslims) sought the Christian community, and some of them came into our Lutheran churches. Recently Syrians and Africans (Somalis, Sudanese and those from the Berber countries like Libya, Algeria, Tunisia, and Morocco), most former Sunni Muslims, have been looking for churches. 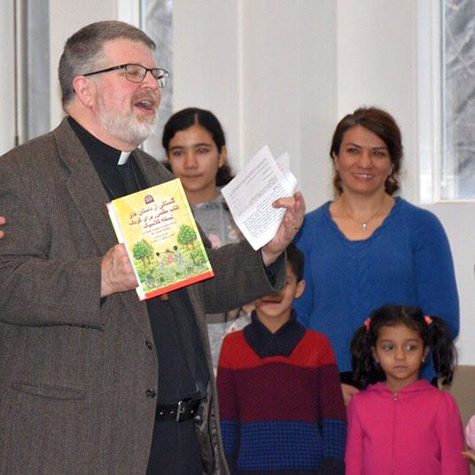 In addition to a recent reprint of the Farsi-language Small Catechism, Iranian immigrants are eager for A Child’s Garden of Bible Stories (pictured in header photo) and Only One Thing Is Needed (above), a book of daily devotions. Not many in the Church here can speak Farsi, so the Christian mission efforts of anyone who can help are carried out by every means available, especially literature. As soon as we had access to the Farsi Small Catechism from LHF, we could let them read and comprehend for themselves. Since that beginning, the Prayer Book in Dari from LHF has arrived, which has been for many a wonderful help for prayer because Muslims come from their own tradition of prayer, and they find it extraordinary and different that they can pray to our Heavenly Father. The books have been distributed from 10 large refugee centers where everyone can attend Lutheran instruction. 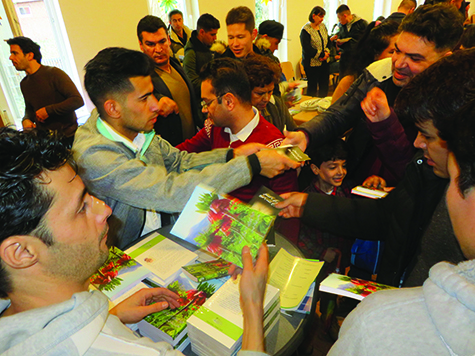 In North Jutland, around 100 Iranians have sought out the Church. Some came from other church communities where there was no one who was prepared to give them catechism instruction. The locals asked for a few catechisms and gave them to the Iranians. They began to read in groups — they learn through memorization — and as they have come to know Danish better, they’ve been able to express their faith and understanding of the Lutheran faith clearly. But there are also refugee centers near Bording in central Jutland, where Iranians wait to be sent back to Iran (a kind of limbo, since Iran will take no compulsory returnees). Every Wednesday evening, there is a cafe gathering where 50 men (women can remain in Denmark — they are not sent back) have more or less all read the Farsi Catechism, and some have come to faith. This has given these men hope, not only for asylum, but for the Hope that comes through faith in Christ. One of the pastors has written to me that Luther’s Small Catechism in Farsi has become the basic book for catechism instruction. It is a pedagogical masterpiece that has transcended time and culture. Another man, an engineer who is a volunteer with the refugees, told me of an Iranian family who was in the process of being sent back to Iran. The father couldn’t read, so he didn’t know how he should prepare for the required interviews with the government authorities. In his interview, the father was asked why he had joined the Lutheran Church. His answer illustrated how he had learned to memorize the catechism because he replied that the Christian Church, first and foremost, is a place where love and loving people meet, not like in the mosque. “Perhaps I can’t give my life for my own children, but I have come to realize that Jesus went to the cross and died for me, so that my sins can be forgiven,” he explained. “The spirit of Jesus has come and changed me, so that I am one with others who believe in Him.” This man had memorized the foundations of the Christian faith ONLY because his family had read the catechism to him! Reprinted with permission from the Missionsblatt of the Bleckmar Mission, August-September 2018.